After sales of 150,000 or more electric luxury cars from Tesla Motors over four years, the first major wave of long-range electric cars from established luxury automakers is now on the way. So far, it seems the first of these vehicles will not be sedans that compete with the Tesla Model S, but crossovers apparently targeting the Silicon Valley automaker's Model X. Over the past year, Audi, Jaguar, and Mercedes-Benz have all unveiled concepts for electric crossover utility vehicles at major auto shows. All three preview future production models, but none of these electric luxury SUVs will start production until at least 2018, however. In the meantime, here's what we can expect based on the recent crop of concepts. 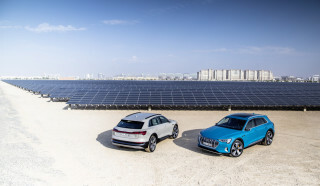 Audi was the first of the trio to commit to an electric SUV, confirming plans for a 2018 launch even before its e-tron quattro concept debuted at the 2015 Frankfurt Motor Show. The production version will be called simply e-tron, a format meant to reference the original Audi quattro, which introduced the automaker's now-famous all-wheel drive systems. Powertrain components and much of the styling from the e-tron quattro concept will likely translate to the e-tron production model. The concept followed the current trend of "crossover coupes," with a low roofline combined with more traditional SUV styling elements. It had a 95-kilowatt-hour lithium-ion battery pack and three electric motors—one at the front, two at the rear—providing a total of 369 kilowatts (496 horsepower) and 590 lb-ft of torque. Audi claimed a range of 310 miles for the concept, albeit on the highly-optimistic European testing cycle. A comparable U.S. EPA range rating will likely be as much as 30 percent lower. 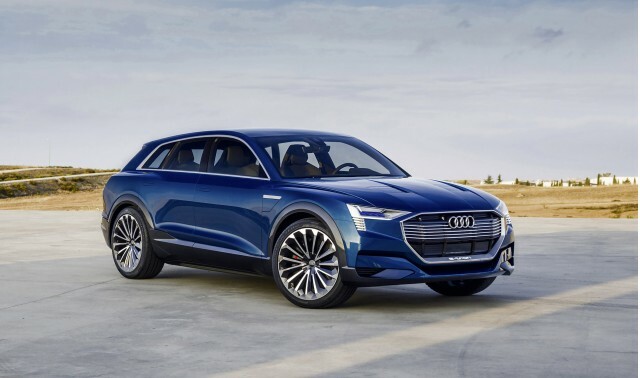 Audi also claimed the e-tron quattro concept could do 0 to 62 mph in 4.6 seconds, with a top speed limited to 130 mph. Lithium-ion battery cells will be supplied by South Korean firms LG Chem and Samsung SDI. The car will be built at an existing Audi plant in Brussels. Audi has also indicated it will build a network of DC fast-charging stations for e-tron owners, with 150-kW charging capability, although details as to how this will be accomplished in the U.S. remain undisclosed. 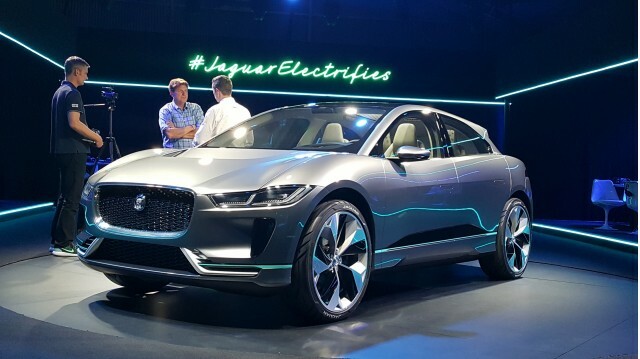 Previewed by a concept at the 2016 Los Angeles Auto Show, the Jaguar I-Pace will also go into production in 2018, within months of the Audi e-tron's launch. The production version is expected to look similar to the concept, meaning it will have fairly dramatic styling that marks a major departure from SUV orthodoxy. At the L.A. show, Jaguar design boss said the I-Pace, which features a cab-forward design and muscular bulges around the wheel arches, was inspired by the Jaguar C-X75 supercar from 2010, which ultimately never made it to production. Underneath the floor of the concept sits a 90-kWh lithium-ion battery pack, with cells from LG Chem, that Jaguar says will provide a 220-mile range on the EPA test cycle. The I-Pace is powered by a pair of electric motors—one for each axle—that produce 150 kW (200 hp) and 258 lb-ft of torque apiece, according to Jaguar. 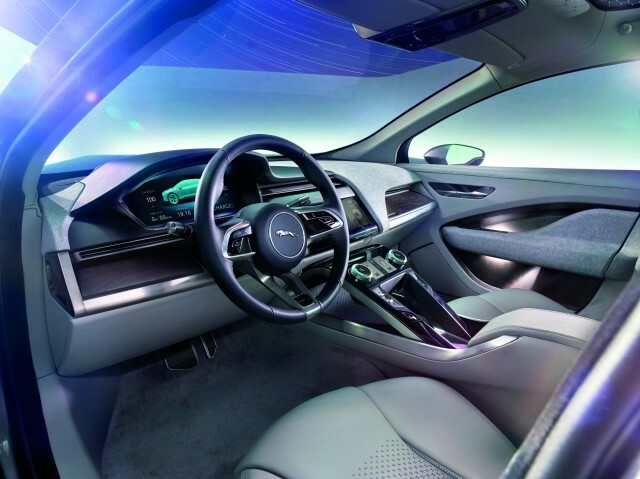 Jaguar also claims 0 to 60 mph acceleration of around 4.0 seconds. The I-Pace will come standard with DC fast charging, using the CCS protocol. Jaguar will contract out its assembly to Austrian firm Magna Steyr, which will start building the electric SUV in March or April 2018. 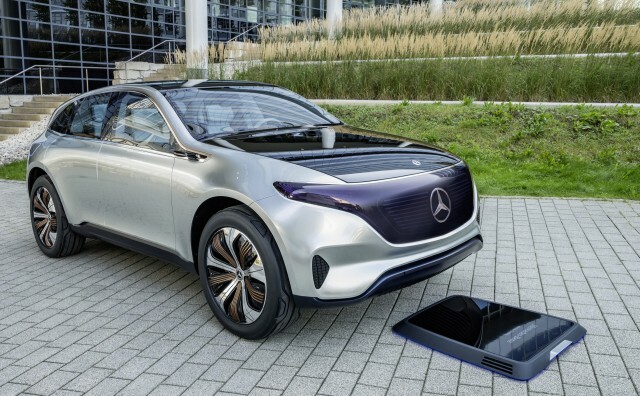 Mercedes-Benz's electric SUV will not only be the German luxury automakers first mass-market long range electric car, but also launch a new "EQ" sub-brand, analogous to BMW i.
Mercedes has said it will launch no less than 10 electric cars under the EQ sub-brand by 2025. 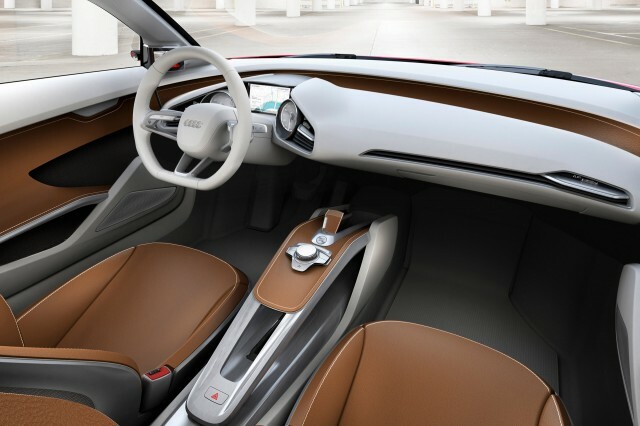 That first model will be the electric SUV previewed by the Generation EQ concept that debuted at the 2016 Paris Motor Show. The Generation EQ has what may be the most conventional styling of the three concepts discussed here, with an upright roof and relatively simple side surfacing. Under the skin, the Generation EQ is powered by two electric motors—one for each axle, as in the Jaguar—producing a combined 300 kW (402 hp). 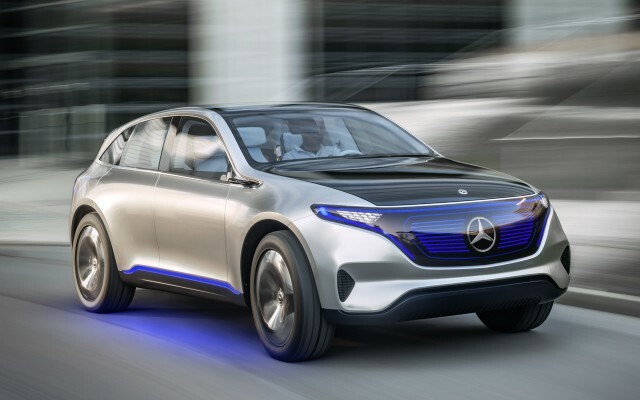 Mercedes claims that will get the concept from 0 to 62 mph in under 5.0 seconds. A 70-kWh lithium-ion battery pack uses lithium-ion cells from Mercedes parent Daimler's Deutsche Accumotive division. 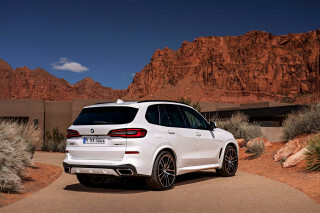 Mercedes quotes a range of 310 miles but, as with the Audi e-tron, that is likely as measured on the European testing cycle, so an equivalent U.S. EPA rating would be somewhat lower.